A mock-up of a wide-body passenger aircraft jointly being developed by Moscow and Beijing has been presented at Airshow China. The new plane is expected to challenge the Airbus-Boeing duopoly. 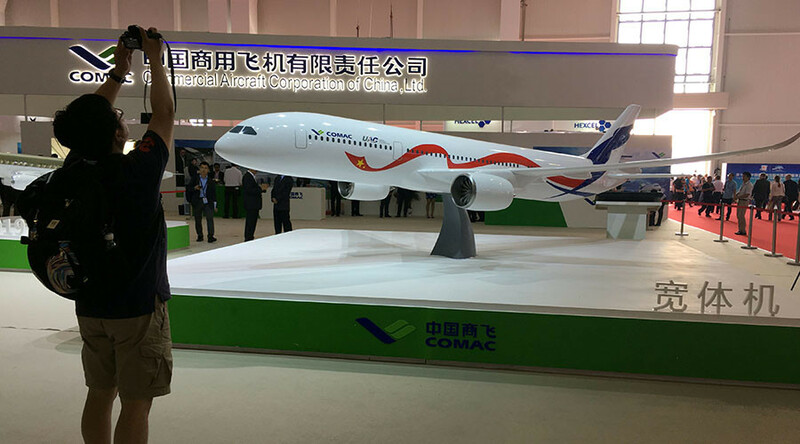 Manufacturers Russia’s United Aircraft Corporation and Commercial Aircraft Corporation of China (COMAC) have announced the start of the search for suppliers. They didn’t provide any details on financing or technical specification. "We will choose suppliers who have rich experience in development, whose products are competitive globally, and who can continually guarantee quality from the development stage until the planes go into operation," Guo Bozhi, general manager of COMAC's wide-body department told Reuters. US firms Honeywell and United Technologies Corporation have reportedly discussed the jet with COMAC officials at the air show. The Russia-China joint venture will start this year, according to Guo. The firms plan a maiden flight in 2022 and deliveries to begin in 2025 or later. "A wide-body jet is an extremely complicated product, which will require a lot of skills (to develop) and require broad industrial knowledge," Guo told reporters. "China and Russia each have their own advantages." The memorandum on the creation of a new airliner was signed in 2014 during President Vladimir Putin’s visit to China. It is part of a $13 billion aviation cooperation deal. The basic version of the aircraft will have 250-280 seats and a range of 12,000 kilometers. The plane will be developed in Russia and assembled in China. It will be based on the Russian-designed IL-96, and will have two engines instead of four. Russian Deputy Prime Minister Dmitry Rogozin said in June the construction of a heavy-lift aircraft engine for the plane has already started.